Whether you are a beginner or a seasoned pro, finding the best fishing gear is a significant factor for each and every angler. This is certainly the case for fly rods, as the rod itself will play a crucial role in having an efficient and productive experience out on the water. With regular practice, mastering the art of using fly rods can be incredibly fulfilling, and can tremendously improve overall technique. Fly rods are specifically designed to utilize momentum, distance, and direction when casting flies. By nature, these types of rods are meant to provide increased control over these three elements when fly fishing, allowing anglers to improve upon and use momentum, distance, and direction to their advantage. Fly fishing is a highly specialized method of fishing, which certainly translates into using a highly specialized rod. Without using the best fly rods, anglers may find themselves at a disadvantage when fly fishing, struggling to cast flies to fish efficiently. Some fly rods are created to better suit certain casting styles, skill levels, and species of fish, making finding the best fly rod a crucial task for every fly fisherman. 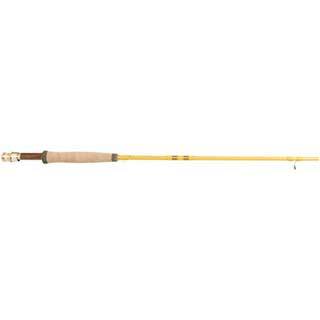 Looking at highly reviewed fly rods is an efficient way to determine which models and components work best. To aid anglers in the search for the best rods to invest in, our review has compiled a listing of the best fly rods currently on the market. Because matching weight for the rod, reel, and line is so crucial, fly rods mostly come in prepackaged sets. This review will take a look at fly rods that are available both independently and as part of a set. These rods have all generated high numbers of positive customer reviews, and tend to offer varying combinations of durability, precision, and strength. By taking an in-depth look at the top-rated fly rods, any angler will find themselves well-equipped to choose the best fly rod for their fishing needs. As a manufacturer of high-quality fly fishing equipment, Eagle Claw prides itself on offering fly rods that are of the highest quality for amateurs and professionals alike. Each and every rod is tested for qualities of durability, strength, and reliability before they become available for purchase. With a mixture of fiberglass and graphite construction, this Eagle Claw fly rod combines flexibility and durability into one dependable package. The dual components manage to allow for a little more give from the rod itself, without becoming overly flexible. The stainless steel guides ensure that the fishing line stays in place, even in windy conditions. Customer reviews rave about the high quality of this reel, particularly when considering its affordable price. With the fly rod action settling somewhere between medium and fast, this fly rod is perfectly suited for professional and amateur anglers alike. As the premiere manufacturer of fly rods, it is no surprise that Eagle Claw has more than one spot on our list of top-rated rods. For those who are looking for a little heavier line weight than the previous model, this 8' fly rod is ideally suited to manage heavier flies and lines. As a result of the extended length, anglers will find an extended ability to produce long, smooth casts with this particular model. The slow-action construction allows for increased flexibility, allowing this fly rod to easily bend without sacrificing durability. This Eagle Claw fly rod is structured to maintain dependability and efficiency even when under the heaviest of loads, making it virtually unbreakable. The seven line guides ensure that fishing line stays put throughout each and every cast, making for a thoroughly reliable and efficient fishing experience. For anglers looking for a functional, flexible fly rod that offers high value for a low price, this Eagle Claw Featherlight model is a perfect option. Unique to Piscifun is their integration of their Precision Rolled Japanese 30-ton Toray carbon fiber blanks. This is what generates smooth and reliable loading for each and every cast, making this Piscifun fly rod a highly sought-after piece of fly fishing equipment. The ring stripping guides work together to drastically reduce friction and heat to minimum levels, improving the overall life of the fly rod. As an additional benefit, the stainless steel guides provide ultimate protection against corrosion and water damage. For fly fishermen looking to switch between saltwater and freshwater angling, this is an important feature. With moderate to fast action performance, this fly rod is well-suited for an array of techniques and skill levels, making it a prime choice for a range of fly fishermen. 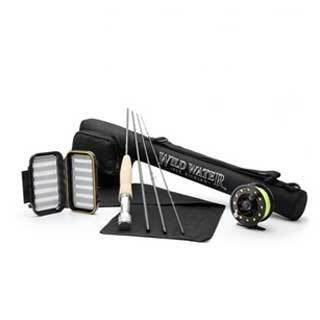 For fly fishermen who don’t want the hassle of assembling additional equipment, the Wild Water Fly Fishing Starter Package offers the perfect solution. This package comes with literally everything that a fly fisherman needs, from the fly rod down to the actual flies. Since everything is manufactured to coordinate along with the fly rod, there is no need to worry about loading the wrong line weight, or even about transporting the rod from one place to another. The large arbor reel comes equipped with a center disc drag, ensuring a smooth and reliable casting performance. As an additional benefit, the reel is pre-spooled with backing and 3/4 weight line. At 7 feet, this fly rod is the optimum length for fly fishermen who are just learning how to cast flies, or for those who are looking for shorter, more precise casts. The slow action, mid-flex design allows for just enough give to allow more experienced anglers to experiment with technique and form while allowing room for new anglers to learn and grow. 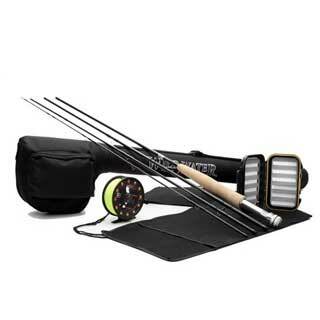 Similar to the previously reviewed starter package, the Wild Water Fly Fishing Complete 5/6 starter package comes with everything that a beginning angler needs to have a successful fly fishing experience. From the rod, reel, fishing line, carrying case, and even the flies, Wild Water provides a wealth of products to suit the basic equipment needs for any fly fisherman. What sets this particular rod apart from the competition is that the 9-foot reach allows for greater casting distances, as well as heavier lines and flies. Compared to the 3/4 starter package, the 5/6 package from Wild Water is a much better option for fly fishermen who have already begun to master their casting techniques. Whether looking to fish in a local pond or dip into trophy trout waters, the 5/6 package comes with a fly rod that is both flexible and durable enough to withstand heavy pressure and changing environmental factors. As the fishing industry expands to incorporate higher levels of technology and innovation, finding the best fly rod can indeed become a confusing process. There are a few standard features to look for when examining which fly rod is the best choice for you. Keep these features in mind, as they can help separate average fly rods from the best fly rods. This will determine the level of flexibility that the rod has. Flexibility is measured on the backcast, meaning that the more the rod bends during the backcast, the more flexible it is overall. A slow-action fly rod will have the greatest amounts of flexibility, while a fast-action fly rod will be almost entirely rigid. A medium-action fly rod will be the most versatile, falling somewhere in between rigid and fluid flexibility. This is particularly important for fly fishermen, as the importance of casting precision and control is elevated. The weight of the fly line is what determines the casting distance and efficiency. Make sure to choose a line weight that not only matches the rod but also matches the weight of the fly itself. Not only will this result in the best possible control, but it will also improve accuracy and overall efficiency of each and every cast. While most fly fishing rods will fall between 8 and 9 feet long, the length is an important feature to consider when looking for the best fly rod. 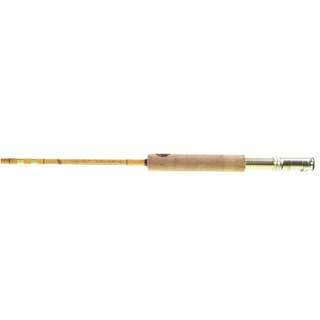 A 9-foot rod is best used for long casts, heavy fly lines, or for fishing against heavy winds. 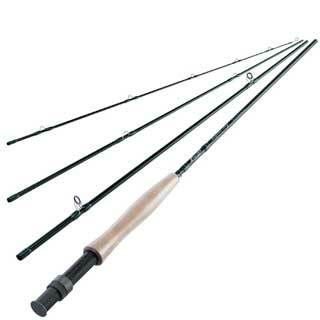 An 8.5-food rod is good for multi-purpose fishing underneath a wide variety of weather and environmental conditions. For short, precise casts in small streams, an 8-foot rod or less will work best. Though looking for the best fly rods can often be a confusing process, one of the best methods to follow is to examine the top-rated products that are currently available on the market. More often than not, these top-rated rods will help separate the mediocre rods from the rods that stand out in performance, quality, and durability. When looking for the best fly rods, make sure to keep elements of length, weight, and rod action in mind. By examining the best fly rods through this perspective, fly fishermen of all skill levels will find themselves well-equipped to identify the perfect fly rod for them.